Please enjoy these presentations from the 2011 AFC Annual Convention. They will be accessible to non-members for a limited time only. Once they are archived, you must be a member of AFC in order to access them. 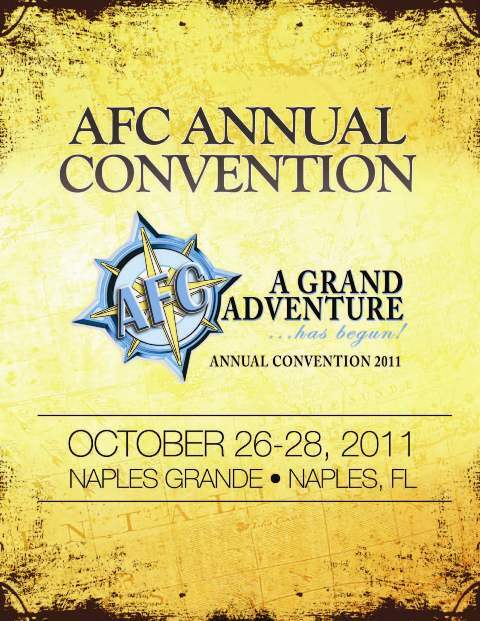 Click on the picture of the Program Cover to download a copy of the 2011 AFC Annual Convention Program. Description: Should Boogie Boarding be allowed on campus? Do colleges really care about their students? Can paperwork be condensed and workloads reduced? Check out the award-winning exemplary practice presentations from John, Teri and Julia. Presentation: Non-traditional Occupations: Why Are We Still Talking About This? Presentation: How to Have the Time of Your Life and Get Your Work Done!